Testo 425 Digital Thermal Anemometer is a compact, easy to use anemometer with attached thermal probe on a telescopic handle. The Testo 425 thermal anemometer measures air velocity from 0 to 4000 fpm and temperatures from -4 to 160° F. Volume flow can also be measured by simply entering the duct measurements into the Testo 425 thermal anemometer. Testo 425 Digital Thermal Anemometer displays reading on a large, clear display. Switching between flow and temperature readings is easy. The Testo 425 digital Thermal Anemometer includes timed and multi-point mean flow calculations which allow for easy flow analysis, volume accumulation estimates, and temperature variation monitoring. Min-Max values are one button simple, while the " Hold " function freezes the current readings in the display for easy data recording. 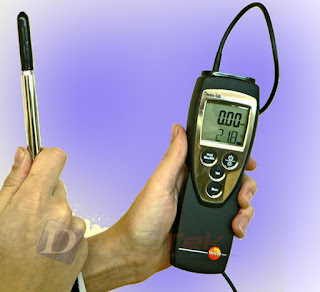 Additional Information anemometer with attached thermal probe on a telescopic handle. We as Testo 425 Digital Thermal Anemometer sales center serve free shipping for Jakarta and surrounding areas, please contact our sales on Mobile: 0812 8380 4273, WA: 0819 3263 2003. 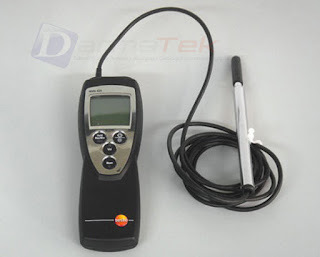 Darmatek is Testo 425 Digital Thermal Anemometer Sales Online Shop, survey tool. We are here as a supplier of land or building survey equipment, telecommunications survey tools, geological surveying or mining tools, and other survey tools including Total Station, Digital Theodolite, Automatic Level, GPS, Compass, Binoculars, Monocullars, Laser Rangefinders, Night Scope, Digital Altimeter , Clinometer, Tandem, Digital Planimeter, Distometer Speed Gun, Measuring Wheel, Measuring Tape, Grounding Tester, Handy Talky HT, Sound Level Meter, and Geological tools, PH Meters, Lux Meters, Anemometers, Thermohygrometers, Thermometers, Sirens, etc.